Ah, maternity uniforms! You’ll most likely have a love/hate relationship with them, for various reasons I’ll share below. At this point in my pregnancy, I’m twenty-two weeks along. I’ve been wearing a mix of maternity and normal uniform pieces, so I’ll share what I’ve learned so far. If you’re a Reservist (and probably Guard too), you’re in luck! You’ll be issued maternity uniforms, or at least the basics to get you by. As soon as you learn that you’re pregnant, it’s best to see the clothing monitor in your orderly room, also known as the Commander’s Support Staff (CSS) office. When I learned of my pregnancy, I found out that budget constraints were making for a long wait time. Better to put in your request before you actually need them and can’t wear your normal uniforms anymore. The stretchy panel at 22 weeks. Who doesn’t love the maternity jumper?! If you should have to wear an infrequently worn uniform, I’d highly recommend checking out the AFI well in advance of your event. I learned late in the game that service dress required me to wear a long-sleeved blue shirt, which I didn’t own (a maternity one). Thankfully I was able to wear a non-maternity one and it fit fine. Plus, under the jumper you couldn’t tell if I left part of it unbuttoned (which I didn’t need to). Service dress also required the satin tie-tab, which I’ve only ever worn with semi-formal dress when not pregnant. Semi-formal dress requires the white long-sleeved blouse, pretty standard, but it requires that you have chevrons on that shirt, which is atypical of non-maternity uniforms. Do your research so you’re not having to scramble at the last minute! Don’t forget those maternity pantyhose! Currently, I’m wearing the maternity ABU trousers and my regular ABU top. All of my other items are non-maternity, including outer garments, cold weather gear, and sand t-shirts. I’ve had to wear the jumper for my Deserving Airman Commissioning Board, when service dress was required. I haven’t had to wear blues, since I’m not typically there on Blues Monday. Plus, now that the Space Command has put an end to Blues Monday, I’ll probably rarely wear them. Like a little bell! Avoiding this bad boy for now. I was issued one set of maternity ABUs, a short-sleeved maternity blues blouse, a long-sleeved semi-formal white blouse, maternity blues trousers, and the jumper. If my ABUs become unserviceable, I have to swap them out or purchase my own. When I ordered my sizes, I went down one size from my normal ABUs (which were issued at BMT), since I’d heard they ran large. This probably wasn’t the best advice. I can see myself having to get another pair of maternity ABU pants eventually, as I felt like I was stretching the elastic waist to the max when I was first trying them on. The ABU top is very much babydoll shaped at this point, so I haven’t worn it yet. I would look downright ridiculous with that flared top right now, so I’m holding off until I absolutely can’t fit into my normal ABU tops (which are huge) anymore. My normal ABU top covers the elastic panel in my pants, so it’s a non-issue. Maternity cold weather gear is non-existent. If I was Active Duty in a cold location, I’d be in search of maternity thermals in off-white to wear under my uniforms. I have my issued thermals that I just fold down in the meantime, but I don’t know how much longer they’ll fit. Fortunately, most of the outer garments are so large, they’ll grow with me. I’m still blousing my pants and wearing my boots, which I intend to do for as long as possible. I can see this being an issue as my stomach gets larger. Interestingly enough, the maternity ABU pants aren’t hemmed at the bottom (despite being available in short, regular, and long lengths), so keep this in mind if you decide to start wearing athletic shoes with your uniforms at some point. Many women have a love/hate relationship with the maternity uniforms. Ask around and most moms will tell you that these must have been designed by a man, due to the lack of stylishness and functionality. You can see in my pictures that most of these pieces are pretty unattractive and are meant to function, rather than flatter. The elastic in the maternity ABU pants can be really bothersome. The suggestion was made to me to take the elastic out and replace it with a drawstring cord of some type, so it’s not as uncomfortable. The maternity jumper is something no one looks attractive in, but at least it has hidden side pockets! It’s a very “freeing” garment though, which is a plus, and there’s nothing constricting you. Be careful – the sizing runs big. I can fit my entire family in the jumper, husband included. You might consider having it taken in on the sides, which was recommended to me as well. Just be careful that your maternity blouse underneath doesn’t make it look lumpy if you have it tailored. My biggest complaint is the lack of functionality in the maternity ABUs. It’s as though the designer viewed pregnant women as completely useless, even in the office. There are no hip pockets in the pants, only tiny pockets on the sides. The blouse has no breast pockets, just two small patch pockets in front. Neither garment has pen pockets. Absolutely ridiculous, especially when you figure that most pregnant women are going to be kept inside an office, doing administrative tasks during this time. As a Personnelist, this is really frustrating to me, and this is why I’m holding onto my non-maternity top for as long as possible. I’ve found that a positive attitude and smile goes a long way when sporting these uniforms. No one is going to look particularly attractive, so you may as well have fun with it! I owned that maternity jumper and it was a great conversation starter in my squadron. If I would’ve dwelled on the negative, I know that would’ve come across during my board, and potentially affected my confidence and outward appearance to the board members. Stay comfortable, Airman mommy, and rock those maternity uniforms! 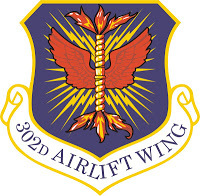 I am excited to announce that I’ll be working with the newly formed Development & Training Flight (D&TF) for the 302nd Airlift Wing at Peterson AFB! D&TF is a new(er) program that Reserve units are adopting, slowly but surely, across the country to help prepare those who are waiting to ship to BMT. Active duty enlistees typically have their own monthly meetings and activities, although they may take on a different form. When I enlisted, my monthly DEP (Delayed Entry Program) “meetings” consisted of a weigh-in and signing some papers. There wasn’t much in the way of networking and knowledge sharing. D&TF changes all of that and better prepares people for BMT. Meeting your fellow shippers, staying motivated, and getting paid [yes, you’ll get paid for attending]? What’s not to like about that set-up! D&TF is designed to meet during the normal UTA weekend for Reservists. I took a peek at our agenda and it’s going to be packed. Think of it as my website and BMT Facebook groups in real time. Saturday starts early, at 0600, and I think lights out was around 2100, or something similar. The time in between that was scheduled for PT, transit time, briefings, meals, and various other activities. There will be classroom knowledge (the Airman’s Creed, the Air Force Song), information from legal and finance, and endless opportunities to network with fellow trainees heading to BMT. I spoke with the Airman who will be leading our D&TF today and I am so excited about what she has in store for our enlistees! Anyone else participate in D&TF? What has been helpful for you? What hasn’t worked out well? I appreciate any and all input on your D&TF experience, as it’ll help us mold ours! This entry was posted in D+TF, UTA on December 19, 2012 by admin. During this time of gift exchanging and holiday gatherings, As you can imagine, the mission of this organization is near and dear to my heart, as the spouse of a service member and as a service member myself. Circumstances have prevented me from participating since I’ve been here in Colorado, but I found a wonderful way to contribute this year. WAA is offering a chance for you to Help Cover Arlington, and it’s not too late! There are tons of sponsorship options, including the Military Tribute Patriot Pair, which I jumped all over. For $34.50, you can donate a wreath and receive one of your own, with an American flag and the service flag of your choice! This isn’t the thin variety of wreath you find at your local home improvement store or grocery store – this thing is plush. Our new home is proudly sporting a gorgeous Air Force wreath, and I love that one will be decorating the grave of a veteran at Pacific View because of our purchase. Wreaths Across America Day is this Saturday, December 15th. If you aren’t able to donate, consider going out to a participating cemetery this weekend. Remember. Honor. Teach. This entry was posted in patriotism, PGR, volunteering on December 10, 2012 by admin. Future commissioned officer…or official tour guide? December’s UTA marked the convening of the Deserving Airman Commissioning Program Board (DACP). Where I was told that being round and in a small tent I wouldn’t fit in any of the newer uniforms. [Editor’s Note: This is what happens when you leave your draft unattended and your DH gets at it.] My appointment was at Saturday at 0830, and required service dress, which is fodder for another post! Prior to the weekend, I looked into the AFI in preparation for laying out my blues. Good thing I did, too! Apparently maternity service dress requires the long-sleeved shirt (I wasn’t issued a maternity one) and a satin tie tab (which I already owned, thanks to the Awards Banquet). After some problem solving with a pregnant Senior Non-Commissioned Officer (SNCO), I realized I could wear my non-maternity long-sleeved shirt without issue. I rocked the blueberry muu muu that morning, and had a number of fun conversations about my stylish attire. I arrived at the board location the Air Force standard of ten to fifteen minutes early, only to find that aside from one other board member, no one else was there. We took a seat at the conference table and relaxed for a bit while we waited. Finally, the rest of the board members and the MPF personnel in charge of the board filtered in. I gave them some privacy while they reviewed my package and I took the time to center myself. The board consisted of five officers, all O-5 and above. Our board chairman was the Vice Commander of the wing. They try to get representation from each of the groups in the wing, so there was someone there from the Aeromedical Staging Squadron (ASTS), the Maintenance Group (MXG), the Misson Support Group (MSG), and the Operations Group (OG). Fortunately, I was well-acquainted with all but one of the officers present, so I felt fairly comfortable and at-ease. I can’t stress enough how important it is to get involved in your wing through volunteer work, as well as seizing opportunities to further your training and networking. Make sure that people know your name, and for positive reasons. When given the signal, I entered the room and gave a reporting statement to the board chairman. I was a little shaky on that part, only due to the lengthiness of the wording. Luckily I didn’t break from my position of attention and I completed it without losing my military bearing. After being given permission to sit, I continued to sit at the position of attention, just as I was taught at BMT. Remember those BMT skills and procedures! The board members each had a prepared question, during which they took notes on my responses. There’s no time limit given to respond, so I was able to think before speaking and give a thorough, thoughtful answer. The questions were as I imagined for something like this. I didn’t write them down for you after my interview, but you can get the gist from the examples below. Why are you ready for commissioning at this stage in your life/career? What are your strengths as a leader? What are your weaknesses? What do you consider to be the greatest accomplishment in your life and how did you learn from that accomplishment? Describe a time in your life when you faced a challenge as a leader and what that taught you. After the board members made it through their five prepared questions, they were free to ask additional questions of me. I was asked what my preferences were for career fields as an officer. Be cautious about how you answer this. The question was originally proposed to me as which ones did I not want to do, and I truthfully said that I wasn’t closed off to any opportunity, but that my preference was toward logistics or maintenance. Lastly, the board ended in a typical fashion for any interview – by asking me if I had any questions for them. Make sure you come prepared with a question! I let that one slip my mind, so I had to try to think of something on the spot. I left the board feeling strong about my performance, thanks to their positive feedback during the process. I tend to do well in interviews, and coupled with my strong package, knew that I had made a solid case for myself. Well, if you’re a fan of my Facebook page, you’ve already read that I was indeed successful in receiving approval of my nomination for commissioning! What happens now? I have a year to find an available officer slot in my wing, interview for that position, get the A-OK from that commander, pass a commissioning physical, and secure my school dates for OTS. If I go beyond that year, I’ll have to begin the process again from scratch. Thank you for all of your encouragement during this process! This entry was posted in UTA on December 2, 2012 by admin. Long overdue post on what I’ve been up to with my military career! If you’ve been following along for a while now, you know I’ve kicked around the idea of commissioning and I’m finally throwing my hat into the ring. The program I’m about to describe is Reserve specific – if you’re Guard or Active Duty, please speak with a member of your leadership or Military Personnel Section (MPS) to determine the pathways available to commissioning that are applicable to you. Submit package for DACP [more on this in a bit]. Upon approval of DACP board, package is sent to the Numbered Air Force (NAF) and then to the Air Force Reserve Command (AFRC) for subsequent approvals. Member completes statements of understanding if all approvals have been gathered. Given an available slot in your unit, leave for Officer Training School. I am unsure of whether you attend the officer’s version of technical training immediately following OTS. Return to your unit as a Second Lieutenant and begin training/working in your new squadron! The DACP board at your unit determines if you are commissionable, but the NAF/AFRC determine your ultimate fate. In my particular Wing, you can apply once a year if you do not successfully make it through the process one year. Official Transcripts – sent directly to your MPS from your college/university. Official scores for your Air Force Officer Qualification Test (AFOQT). My Wing requires a Verbal score of at least 15 and a Quantitative score of at least 10. Fitness standard memo from your Unit Commander – verifying a current passing PT score. Overall, the package isn’t too difficult to put together. The Chief of Career Development in my MPS was very helpful in showing me how to fill out the forms, which can be daunting. There were a number of fields that I found out I didn’t need to complete. I was also able to view the package of a colleague, which was much appreciated. I had the most difficulty with the cover letter, of all things. I feel as though I said it best in a tweet at the beginning of this month – I know that I’ll have a fulfilling and successful career regardless of whether I’m an enlisted or a commissioned member of the Air Force. So, why this path? I mulled that one over for quite some time. All in all, I’m beginning the process even though I’m not even able to do PT again until 18 Oct 2013. I can only imagine that my OTS date, if chosen, wouldn’t be until after that time. My window of opportunity is limited, as I turn 32 in December, so I can’t wait forever. We’ll see where my Air Force journey takes me next! This entry was posted in education, UTA on November 16, 2012 by admin. Much has been going on in my Wing lately that I haven’t discussed online, due to the sensitive nature of the work. Sure, you could’ve figured it out if you buzzed around online, but better to wait and tell you after the fact. Even PDF members need to make drive-thru runs! The IPR office does a host of classified tasks and knows the whereabouts of all deployed members at all time. Over the period I worked with them, we prepared briefs for our primaries and alternates, managing that event, and controlling the entrance to only those with the appropriate security clearance. When our members deployed, we prepared their NATO and deployment orders, briefed them a few more times, and took accountability countless times. We were a tight knit group, spending tons of quality time together. During the both the ORE and the ORI I worked on the Personnel Deployment Function (PDF) line, which out-processes and in-processes deploying members. While I didn’t work the PDF line for deployers this time, I did get to work the reception line! Reception is my favorite part, one I referenced back in this blog post. One of the biggest responsibilities of my job as a Personnelist is accountability. During reception I get to meet the planes on the flight line, retrieve the manifest documents that detail the members on board the plane, as well as pick up crew orders and flight orders. For someone typically cooped up in an office, you can imagine that it’s pretty exciting for me. There’s just something amazing about being out there that reassures me that I made the right decision when enlisting in the Air Force. It’s been a busy month, to say the least. I’ve been on duty for a total of fourteen days so far, and I’m heading back again this weekend for the regular UTA. I’ve closed on a house, prepared my commissioning packet, and put my new home together, all while entering my second trimester! Thankfully, my days of being without DH are coming to a close very quickly. Many, many good things happening in my life right now and I feel exceptionally blessed! This entry was posted in deployment, DH, family, home, personnel, UTA on October 29, 2012 by admin. I found out I was pregnant a couple weeks before my September UTA, and had my first doctor’s appointment that confirmed it officially just days before. While my intent was to wait for the end of the first trimester to tell the masses, I knew that just wasn’t going to happen with my Air Force family. Keep this in mind when you go into your squadron for the first time after having your medical provider confirm that you are indeed pregnant – you will need to tell your leadership as soon as possible. My Wing’s policy states that you must immediately notify your commander, supervisor, and the medical squadron. My supervisor was a no-brainer (more on that in a sec), but telling the commander was somewhat awkward. “Sir, I’m required to tell you that I’m knocked up.” I work in an office, so it’s not a huge change in my everyday duties. Prior to my UTA, I called my supervisor and informed her of my pregnancy, asking about my next steps. She let me know that I needed to report to the clinic with documentation from my civilian doctor verifying my pregnancy. Fortunately, my doctor was able to fax me a quick note that indicated that I was receiving prenatal care, along with my expected due date. Waiting at the clinic took a while that morning, as I was low on the priority list in relation to other Airmen who were there for annual physicals. When I finally got in, it was strictly a verification of my documentation from the doctor, a briefing on the Wing’s policies, and the issuance of my profile. They didn’t do a separate medical examination or make me take a pregnancy test. I can keep attending drill (although in a restricted status) up until my 34th week of pregnancy. If I want to continue after that, I must live within 50 miles of my duty station [I do], and I must have support from my commander, my doctor, and if I want to do so. A military doctor can restrict me from participating if deemed appropriate. I have to provide a letter from my medical provider “summarizing [my] current health, physical restrictions and expected date of delivery” as soon as possible and every 60 days after the fact to determine if I’m still fit to serve. If I want to perform duties in the continental United States (CONUS) away from my home station, I have to have clearance from a military doctor. I must also provide a statement from my civilian doctor approving travel. If I go into labor during a UTA, I’ll be transferred to a civilian hospital. Pregnancy will not prompt a Line of Duty (LOD) determination – that’s where the military is responsible for your military care because you “hurt” yourself in the line of duty. Basically, I need to make sure I have my own insurance. After giving birth, I can come back to duty with an approval note from my doctor and after being cleared by the military doctor. No standing/marching longer than 15 minutes. The inactivated flu vaccine [shot, not the spray] is recommended. I can’t get a live virus immunization without approval from my doctor. My duty hours may be limited by my doctor. At 28 weeks, I am encouraged to work an 8 hour shift, but it’s not mandatory. I’m excused from wearing the Chemical Warfare Defense Ensemble [No MOPP gear, whoo hoo!] I don’t have to wear a gas mask after 20 weeks or do a gas mask confidence test. I don’t have to wear/carry a flak vest or web belt. After 20 weeks, I can wear closed toed, plain, soft-soled black shoes instead of boots. If I was in an environment that required it, they could be steel toed. No carrying, lifting, pushing/pulling anything heavier than 25 pounds after 20 weeks. I’m exempt from mobility during my profile and for six months after my release date. I may carry a firearm if my duty requires it up to 5 months, but I have to be excused from firing range practice and duties while I’m on profile. I’m disqualified from flying duties and other special duty operators. I have to avoid ladders or working at heights after 13 weeks. That was my day on duty as a newly pregnant Airman. TONS of information and much more than I expected. I quickly learned it was going to be too difficult to hide my news from everyone. Sitting in the clinic that long, getting a profile, yet looking totally healthy and fine? I knew questions would come up quickly. Not to mention, I work in the office where we do clothing issue, so I’d need to speak up when it came time to ask for my maternity uniforms. Fortunately, I’ve made it through my first trimester successfully! This entry was posted in profiles, UTA on October 16, 2012 by admin.